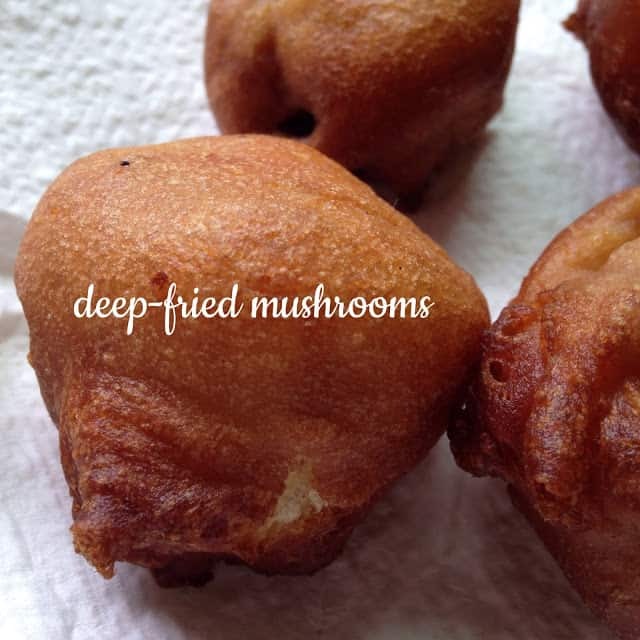 Whether they are served as an appetizer during a football game or as a side with grilled hamburgers, deep-fried mushrooms are always a favorite in my house. This is my take on a favorite that my daughter and I always ordered at one of our local drive-in’s. Do you remember what a “Drive In” is? Do they even call them “Drive In’s” anymore?? Well, if your remember what a “drive-in” is and you still call them a “drive-in” by accident now and then, you must be around my age:) Cough 50-ish Cough.. Back to the story. In Appleton WI, there is a drive-in/fast food called Tom’s Drive In. Tom’s Drive In has served Appleton and the surrounding area for over 40 years. I can remember when my kids were young and we’d go to Tom’s and get 5 burgers and 5 fries for $5.00 or was it 4 burgers for a $1.00 and 4 fries for a $1.00?!? Something like that…Tom’s also had/has the best deep-fried cheese curds, onion rings and fries, they had the best deep-fried mushrooms too. 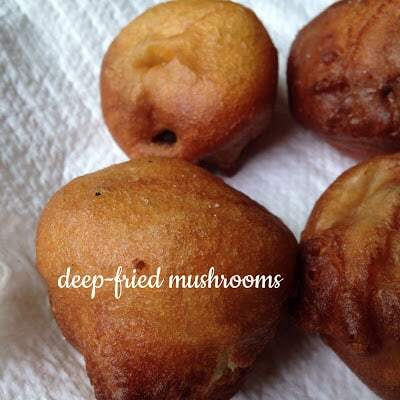 Like I said they had the best deep-fried mushrooms. For some reason and I’m not sure why, Tom’s doesn’t have deep-fried mushrooms on the menu and that’s what inspired me to make my own. Sometimes you just need to reminiscence. Pour at least 3 inches of oil into a large, deep cast-iron Dutch oven. Meanwhile mix beer, flour, garlic powder, salt, pepper, parsley flakes, baking powder, egg, and oil in a large bowl. Mix until smooth and well blended without any lumps. 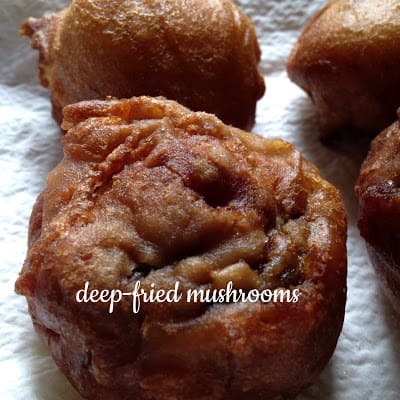 Dip mushrooms into batter and coat well. 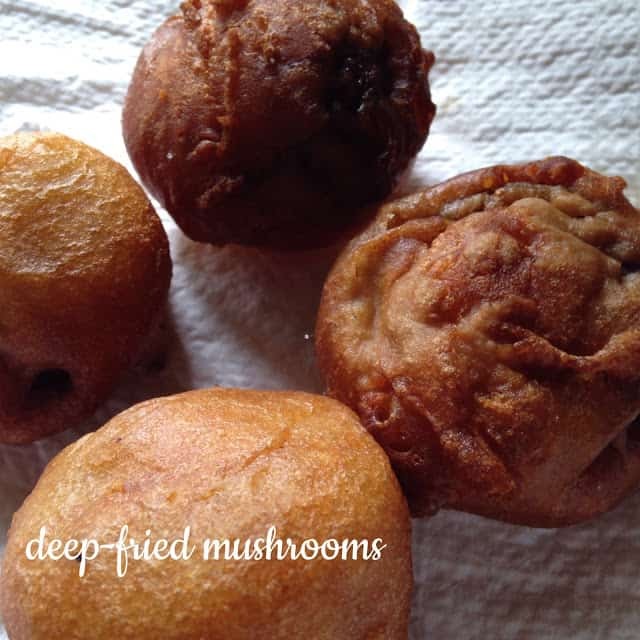 Fry mushrooms in batches in oil until crispy and brown, about 8 minutes. Remove mushrooms to a plate lined with paper towels to drain excess oil. Sprinkle with salt and serve with favorite sauce or ketchup.